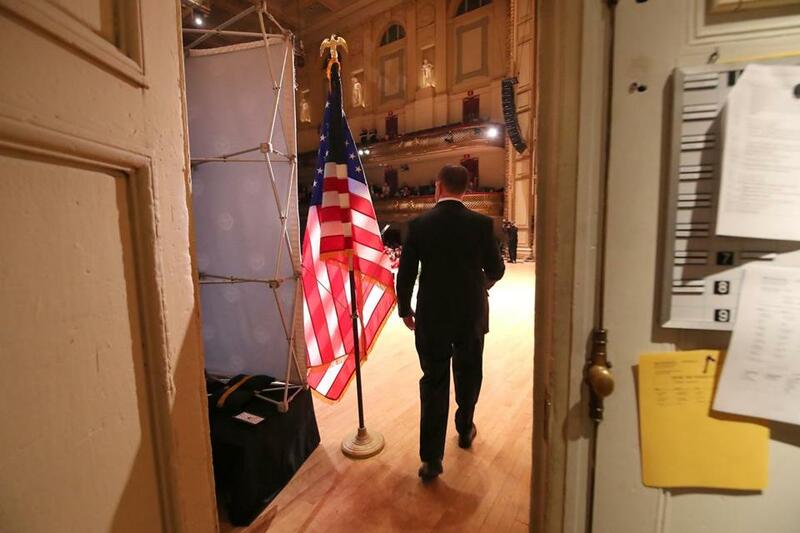 Boston Mayor Martin J. Walsh walked onto the stage to deliver his State of the City address at Symphony Hall. Mayor Martin J. Walsh on Tuesday vowed to fight for the middle class at home and in Washington, D.C., lifting up the city’s efforts as an example for the nation and drawing a contrast with the paralysis that has permeated the federal government. 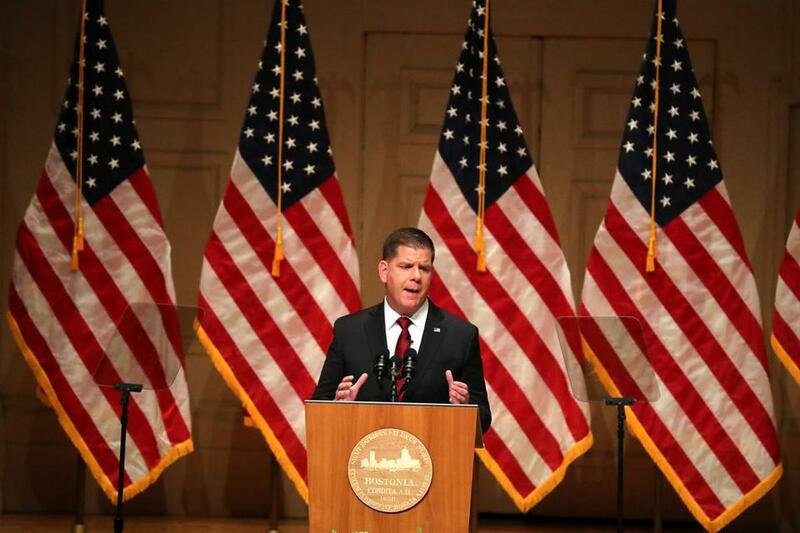 “What happens in Washington, we feel on the streets of Boston,” the mayor told thousands of residents who gathered at Symphony Hall for his annual State of the City address. “But here’s what matters more: What we do in Boston can change this country. We’ve done it before, and we’ll do it again, because in this time of uncertainty and division, Boston offers a way forward,” he continued. It was Walsh’s sixth annual citywide speech since he was first elected in 2013, and the mayor used the opportunity to tout the city on several fronts — from diversity in local government to new housing initiatives and climate change resiliency — despite what he described as an ineffective Washington. Even as the White House “turns its back on climate change,” said the mayor, a frequent critic of President Trump, the city has developed a Resilient Harbor Plan to protect its shores and neighborhoods from rising sea levels caused by climate change. 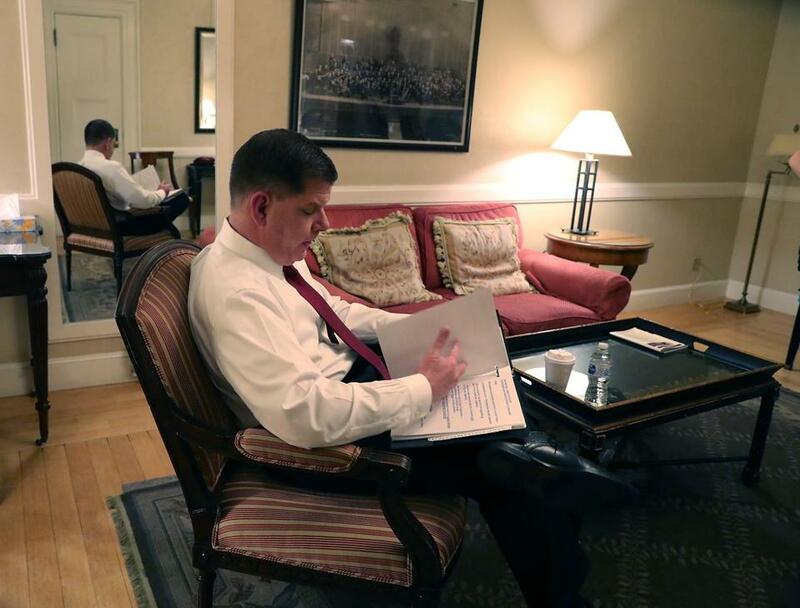 The Walsh administration has set a goal of making Boston carbon-free by 2050. He embarked last year, the start of his second term in office, with an aggressive agenda, though progress has been slow. He pledged to rebuild the Long Island bridge so that he can develop a state-of-the art recovery campus, but that effort has been tangled in the permitting process, with Quincy mounting stiff opposition. Walsh’s resiliency strategy to protect the city’s shore and neighborhoods from the effects of climate change could take years, and it depends on private sector funding. And the mayor parted ways with the schools superintendent he tapped in 2015 after a national search, Tommy Chang. Meanwhile, several policy changes the mayor proposed through legislative action, on housing and education, have died on Beacon Hill. Walsh went over his speech backstage. “We’ll be in every neighborhood, with job training and business workshops, like how to open a restaurant or compete for a city contract,” the mayor said, announcing that a new jazz cafe is slated to open in the Bruce Bolling municipal building in Dudley Square. He said the city is on track to meet his goal of getting 20,000 Bostonians into better-paying jobs by 2022, a Boston Home Center is assisting first-time home buyers, and he pledged to support 1,000 new homeowners in the next five years. Thanks to the windfall from the sale of the former Winthrop Square garage, the city will spend $28 million to revamp Boston Common and another $28 million on Franklin Park, the mayor said. The mayor said that a new Boston’s Age Strong Commission, to replace the Elderly Commission, will serve seniors and “draw on their tremendous strength.” And, a Boston Ways Home fund the mayor set up last year to raise $10 million over four years to combat homelessness has already reached half the goal. Boston has experienced demographic and cultural shifts across the city, and the mayor has vowed to “put social justice at the heart of our vision, because a more equal conversation means a more resilient city.” That means, he said, defending immigrants, working to achieve gender equality, and protecting the rights and embracing the identities of the city’s LGBTQ community. An Office of Diversity was set up to increase the number of women and minority candidates in the city’s Emergency Medical Services and Police Department, and the city recently proposed its first-ever cadet program for the Fire Department in an effort to expand the pool of candidates. That came after a city-commissioned report excoriated the male-dominated culture within the department. The mayor said he will soon sign an executive order to require that all city employees be trained on how to recognize and correct racial and gender disparities in city services. As evidence that the city is moving forward, the mayor pointed to the growing diversity of Boston’s City Council and legislative delegation, as well as the leadership in public safety departments; Suffolk County has a black sheriff, Steve Tompkins, and its first woman of color district attorney, Rachael Rollins; and Boston has its first black police commissioner, William Gross. Former councilor Ayanna Pressley was recently sworn in as Massachusetts’ first black woman in Congress, Walsh noted. 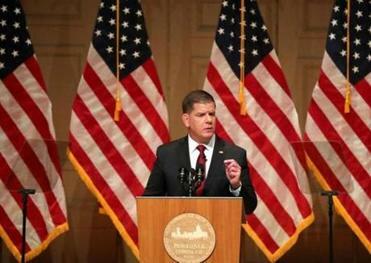 Mayor Martin J. Walsh delivered his State of the City address Tuesday night. The mayor said such leadership and advocacy for the middle class is needed, in Washington and at the State House, as Boston brings a legislative agenda to Beacon Hill for housing and school funding reforms. The mayor said he and Governor Charlie Baker, a Republican who was in attendance, have planned a road trip to Washington to the Republican-led Senate and Democrat-controlled House, with what he called a “united front” to call for investments “that our future depends on” in housing, transit, and the environment. “Instead of building a wall, let’s show them how to build bridges,” the mayor said. Valencia can be reached at milton.valencia@globe.com. Follow him on Twitter @miltonvalencia.